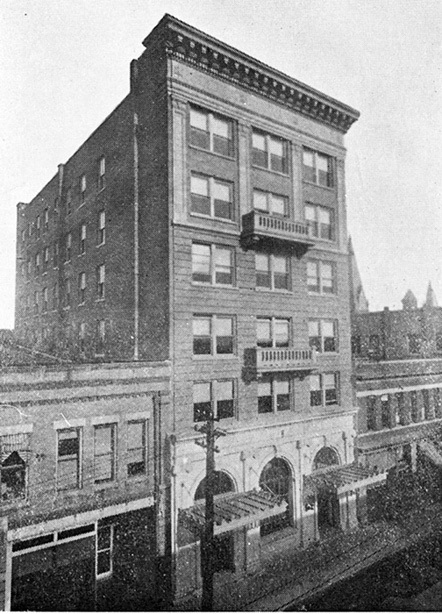 By 1921 Durham’s signature black business, North Carolina Mutual Life Insurance Company, had grown too large for its building on Parrish Street. That building was demolished and a new, six-story one—the tallest on the street—went up in its place. The Mutual occupied the top four floors and the basement of the new, Neoclassical structure designed by local architects Rose & Rose. Mechanics and Farmers Bank occupied the first floor and Bankers Fire Insurance Company, the second. The North Carolina Mutual Life Insurance Building was a symbol of black prosperity and leadership at a time when African Americans in the South had few prospects for progress. To work for the Mutual was a great achievement, a sign of respectability and community responsibility. By the 1960s the Mutual had outgrown its Parrish Street location, and an International-style tower on Chapel Hill Street was constructed at the former site of B. N. Duke’s mansion.